The final confrontation between Mercedes and Auto Union took place through the tram-lined and cobbled streets of Belgrade on the very day Great Britain and France declared war on Germany. 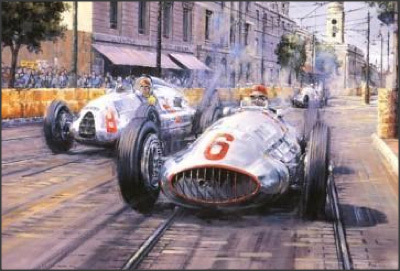 Manfred von Brauchitsch led the race in his W154 until spinning and handing victory to Tazio Nuvolari in an Auto Union. The image depicts von Brauchitsch and Nuvolari racing in close company through the city streets as the sun lowers in the skies over Europe.